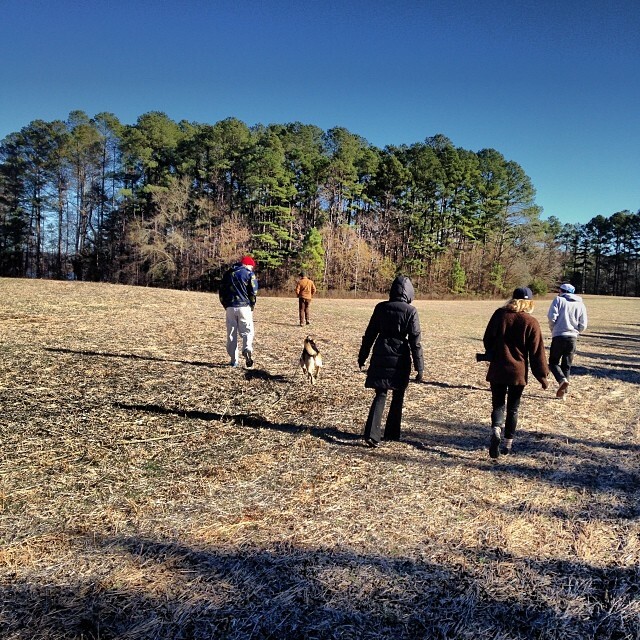 On Sunday, we took the pups on a much-needed hike at a nearby park. We found trails in the mountains that took us about an hour and a half to complete, which was perfect, as we needed to get back to town in relatively short order. 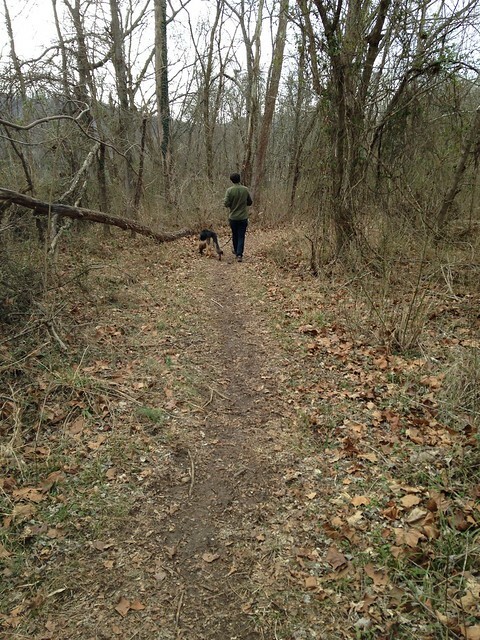 The best part, though, was that the trail was completely empty, so we got to practice some much-needed off-leash recall. We had both girls on long drag leads, and we were outfitted with bits of cooked, real turkey, which proved to be a very strong reinforcer. I have to say, I was so impressed with our girls! Living in the city, they are very rarely off-leash, so this is not a behavior that we often get to practice. But they did so well. They stuck to the trail and came back to us every time we called. Pyrrha’s recall (to me) is pretty foolproof. During the latter part of the hike, she just walked right alongside me. We still need to work on her coming to Guion (as you can see from the first picture of the dogs in this post, she is still nervous about interacting with Guion), so we practiced with him being the only one to reward her when she came back to us. Eden still needs to work on the actual coming to us, but she always stopped to wait for us to catch up during the whole hike — and she always stopped to reorient and turn to us when we called her. It was very cute, and it put us both at ease, as she never allowed herself to get out of sight. We worked on only rewarding her when she came right up to us (instead of rewarding her as we walked closer to her), and she seemed to catch on to this gambit rather quickly. I love using long drag leads to practice this behavior, because you still have the reassurance of control if you need it, and 30-foot leads mean that they can never really get too far away from your reach. The only trick is not stepping on the lines while you hike! We came home with two tired and very happy pups! 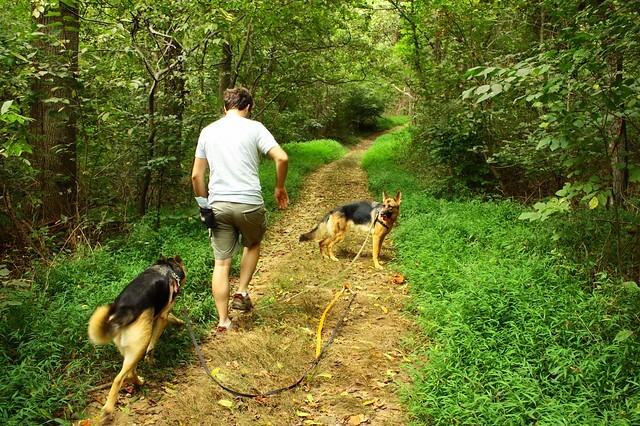 How do you practice off-leash recall? 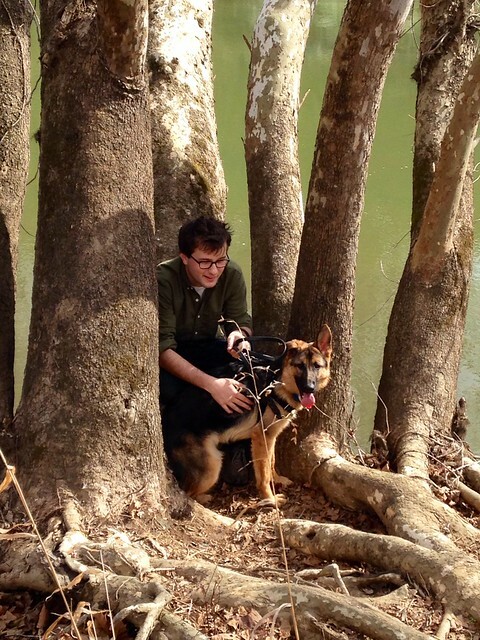 On Saturday, Eden’s first birthday, my family took the dogs (and Dublin) to Fisher Farm, this wonderful nature preserve near my parents’ house. We wanted to wear the dogs out and let them practice their off-leash recall, so we brought long drag lines for our girls and a little bag of tiny pepperoni and treats for reinforcement. 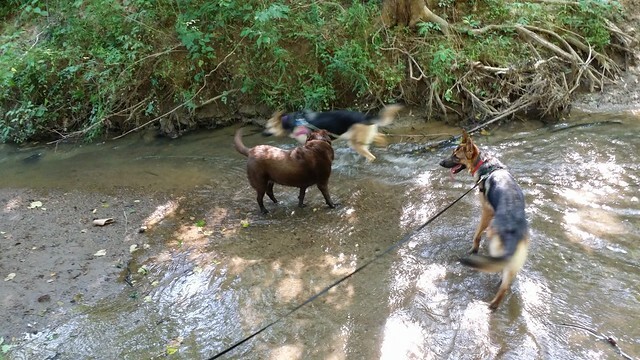 Dublin, being mostly lab, is a natural water dog. Our dogs aren’t, as far as we can tell. 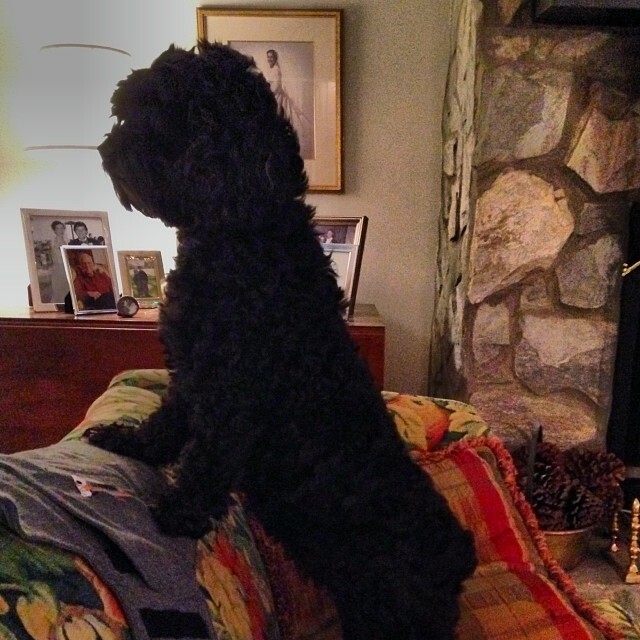 On Friday, at my grandparents’ house, Eden jumped in the lake when we called to her and quickly panicked. I’m glad we were there to help her get out, because she did not like being fully submerged in the water and unable to stand. And, if you’re interested, there’s even a tiny video of the girls running in the river. Watching them romp in the river was wonderful, but I think our adventures in off-leash recall were the most heartening to me. Dublin, as I’ve mentioned, has the most perfect recall I’ve ever seen in a dog; my dad can call her back from chasing a squirrel or approaching another dog. She’ll stop on a dime for him. Our girls? Not so much. 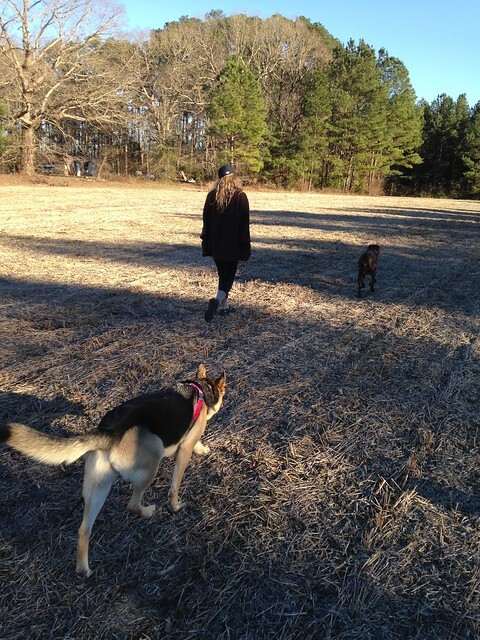 So, to practice, I had a bag of treats, and we had both girls on drag lines during our hike through the woods and in the fields. 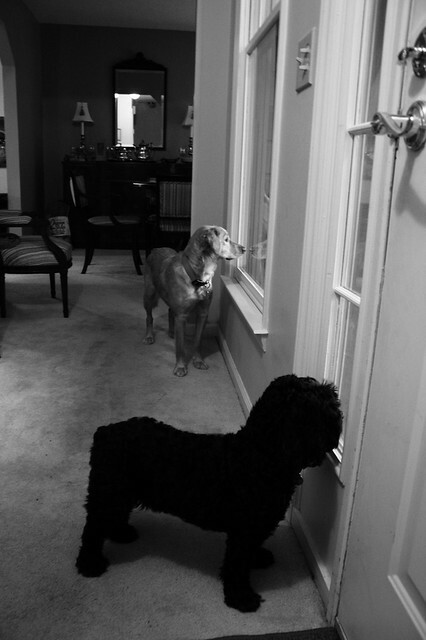 We’d practice letting them get ahead of us and then calling them back, at varying distances, and rewarding them warmly with praise and treats. 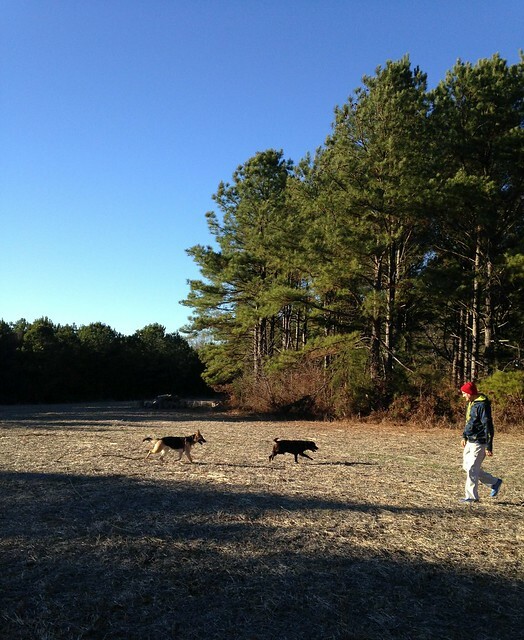 They all quickly caught on to this gambit, and soon, all three dogs would come running to us whenever we called. I was so pleased. Pyrrha is still an absent-minded wanderer at heart. 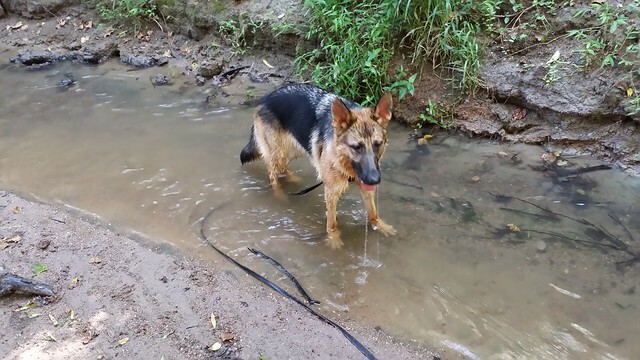 I don’t think she’ll ever be fully reliable off-leash. I’m also the only person that she really wants to come to, which can naturally be a hazard if I’m not around and she escapes. But I was especially pleased with Eden’s performance. 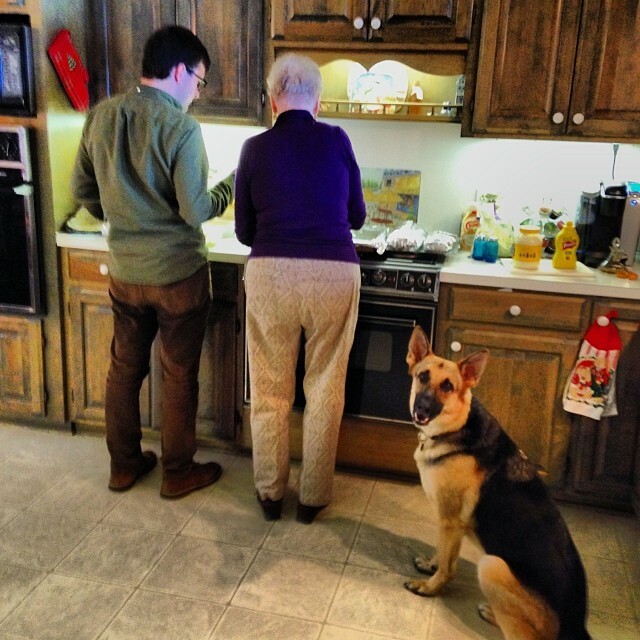 Of all three dogs, even Dublin, Eden was the one who wanted to check in the most. If she got out of sight from the humans, she was always the first to turn around and come back to us, even without being called. Her natural disposition toward people is evident here. I hope we’ll continue to make the time to practice this in a safe place. 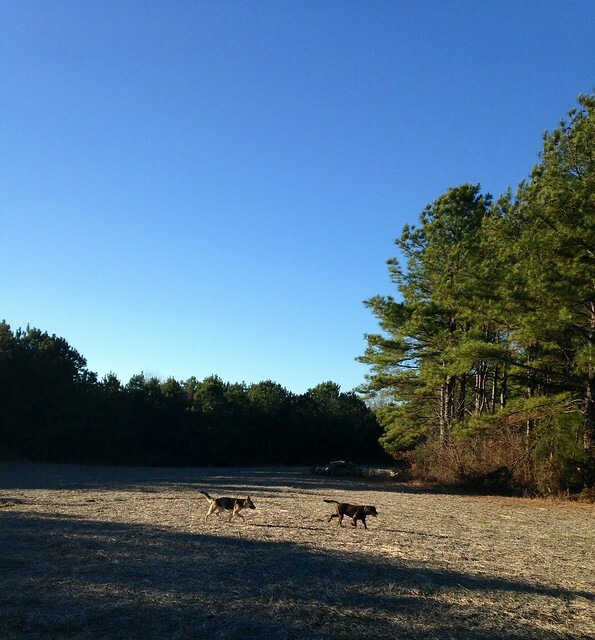 It made my heart happy to see how joyful and relaxed both girls were off leash. Pyrrha especially is such a different dog. Having to wear a leash makes her so tense. 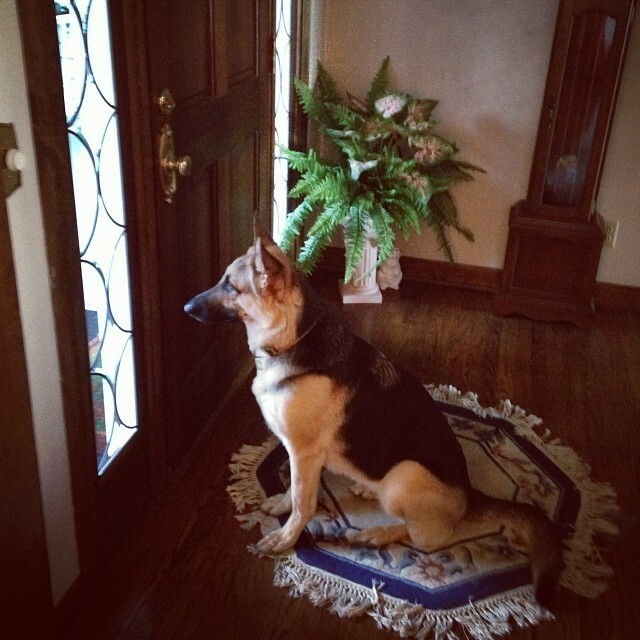 Curious to hear from you: What’s your dog’s recall style? Is he or she a wanderer? Or does he or she stick close by you all the time? 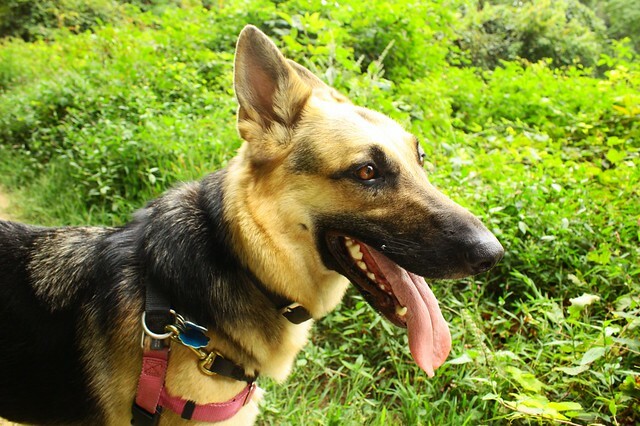 Toward the end of our hike, a female deer suddenly shot of out of the brush near the field, and Pyrrha was off like a shot. I mean, she was GONE after that deer. My natural hunter (Dublin and Eden were not at all interested). I panicked a little, and Dad and I started to run after her. 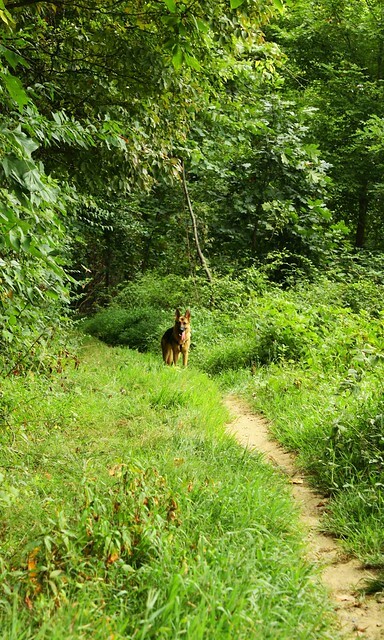 The grass was very tall, and the woods she ran into were deep, and she was completely out of sight. But… a few minutes later: Pyrrha comes running back up to us, exhilarated and breathless. Such excitement on her face! No deer meat for dinner, but I was very proud of her for returning to us, without much frantic encouragement or freaking out on my part. She was on deer alert for the rest of the hike. All in all, it was a perfect afternoon, and an ideal dog birthday party. 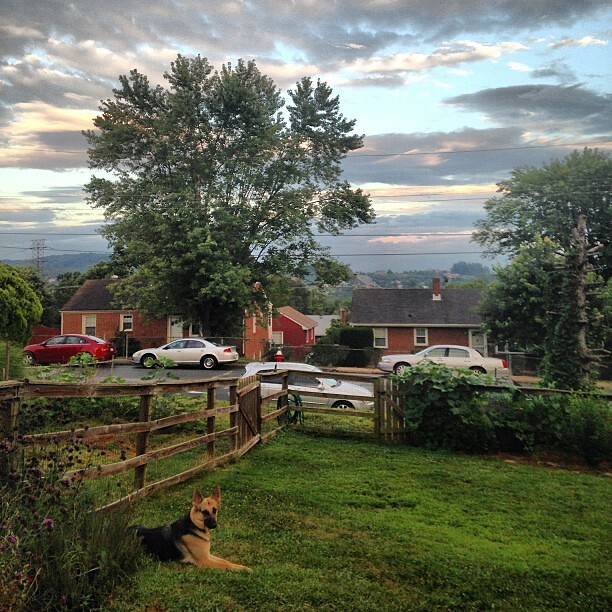 We had lovely, unseasonably warm weather this past weekend, which was very welcome. 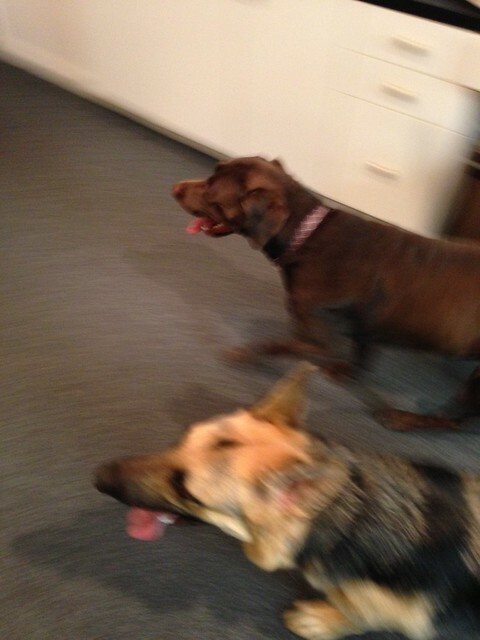 The dogs got a ton of exercise, and they were very calm and content. 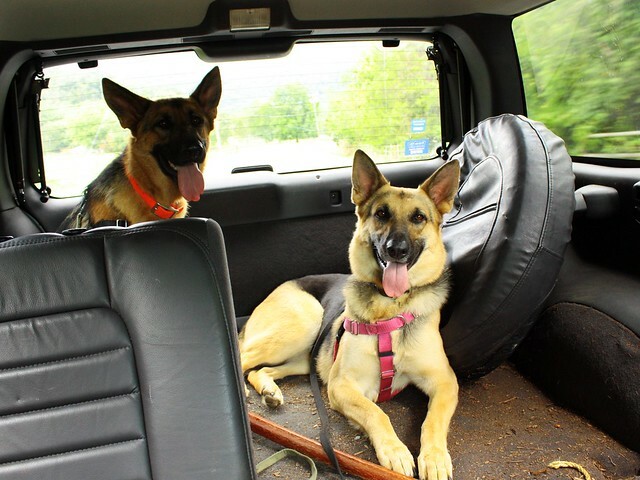 They seem to enjoy each other’s company more when they get lots of exercise; both of them were getting along beautifully, initiating play sessions appropriately, with no disagreements to be had. On Sunday, we took them on a long walk by the river near our house. 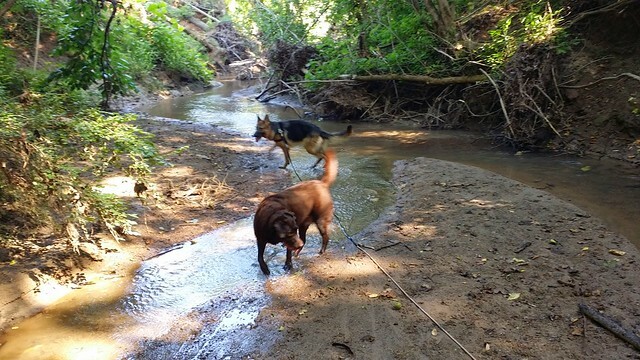 As I’ve mentioned before, on the busy stretches of the trail, our strategy is to have Guion walk Eden in front, and I walk Pyrrha behind, working on our classical conditioning protocol the whole time. Because of this, I get to enjoy the walks less, because I’m constantly on high alert for her two triggers (other dogs and small children), but I think it’s been a good strategy. I’ve been taking the clicker with me when I’m working with her on walks, and I think this has been helpful in signaling to people that I don’t want them and their dog to approach us. I hear people say, “Oh, she’s working with that dog,” and then they keep moving. 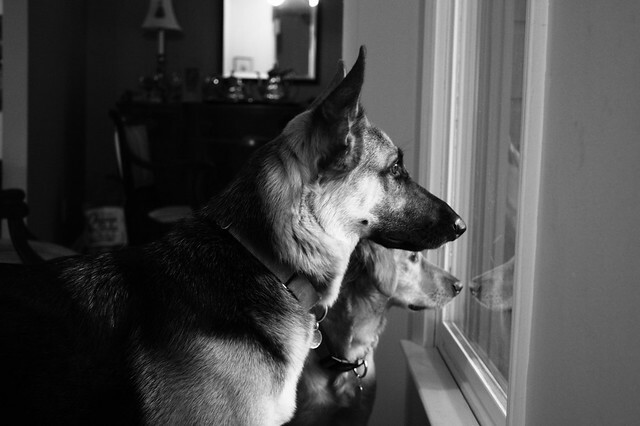 Sometimes, when we stop to let dogs pass, some people seem to assume that we’re waiting for them and their dog to come greet us. The clicker seems to be helpful in communicating that this is not the case, and that we are training here. Pyrrha’s anxiety lessened as the walk went on, too, which I was glad to note. Even though we kept passing dogs, near the end of our long walk, she was far more relaxed about them passing and was accepting treats a lot more gently and readily. Eden continues to be unfazed by everything! She met kids, a man in a wheelchair, other dogs, and other people on the walk. I’m thankful for the abundance of good experiences she’s had so far, as they continue to increase her confidence and her already firmly held belief that the world is FUN and AWESOME and EXCITING. I try to look on the bright side. At least she’s not reactive to adults or teenagers. Pyrrha loves being outside and taking walks. 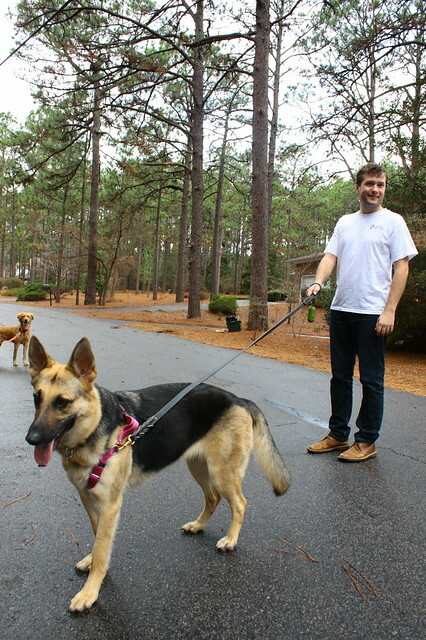 And she actually loves other dogs — just not when everyone is leashed. 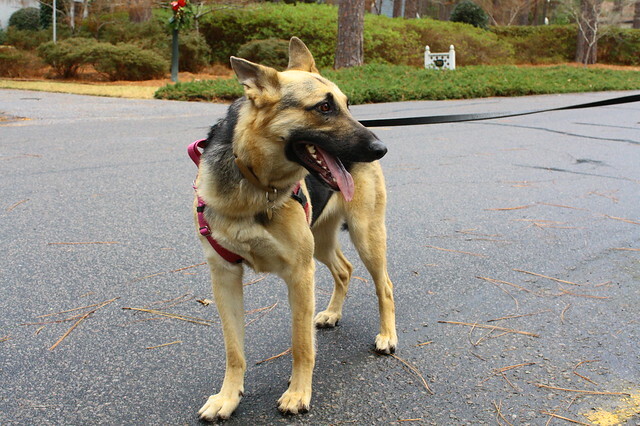 And at least we have one shepherd who can be our breed ambassador, the friendly, goofy baby who loves everyone. Sometimes it’s hard to stay encouraged, when Pyrrha’s progress seems so microscopic. But I just have to keep believing that she is getting better. And take a deep breath. And just enjoy walking the dog. 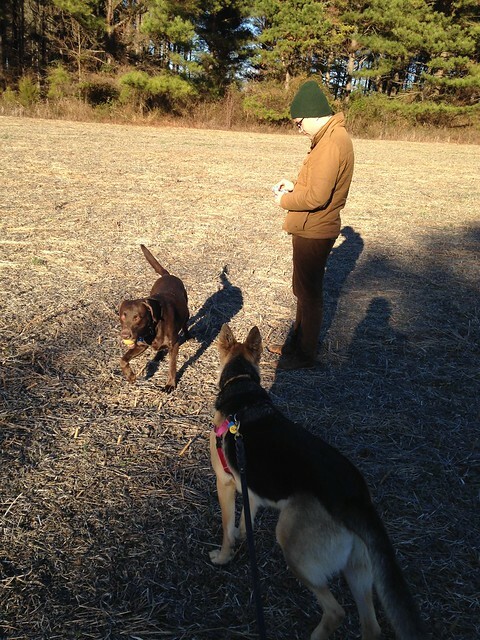 Over this Christmas holiday, our time with Pyrrha was also spent encouraging and training her off-leash recall. 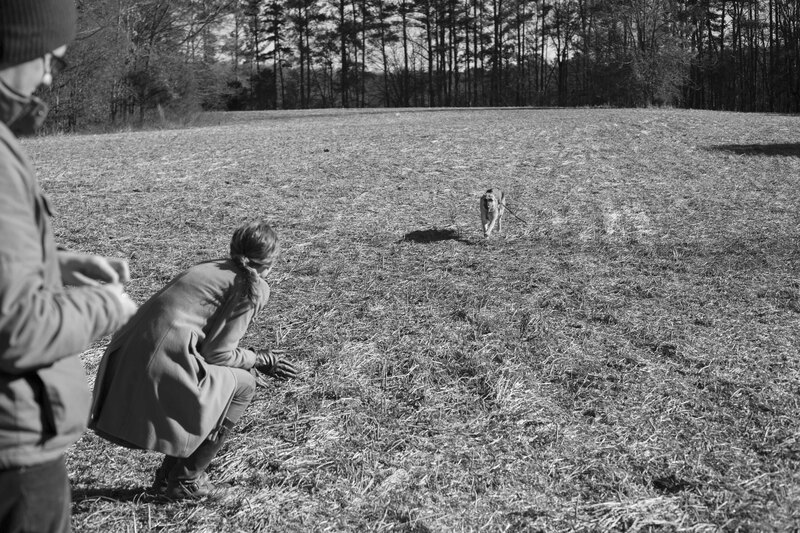 On Christmas Day, we took her out to the field near my grandparents’ house on her 30-foot line. Guion was outfitted with some leftover pulled pork as encouragement. Me, with P on the long line. (c) Grace Farson. This field was the perfect practice ground. 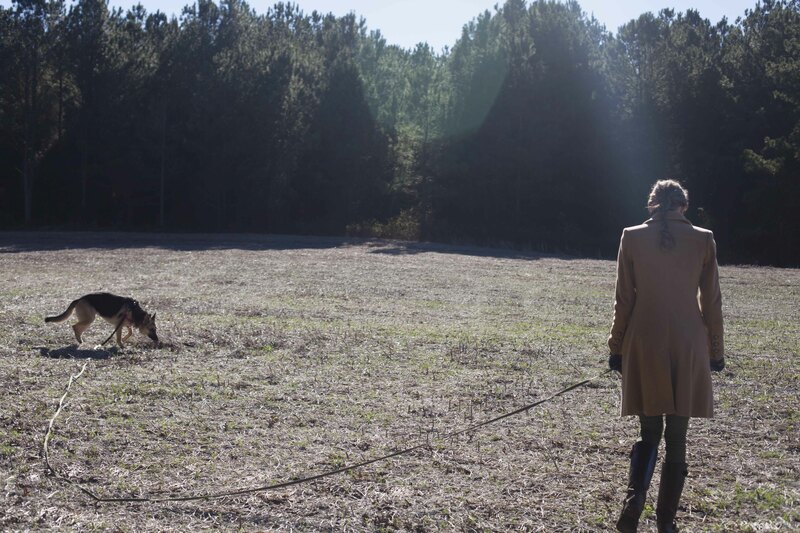 No one lives out there; we weren’t going to encounter any other dogs or people; and the field is bordered by a thick forest and part of the lake. The big field also made me feel more comfortable, because she could never truly get out of sight. We dropped the line, and to my pleasant surprise, she really wanted to stick with us. 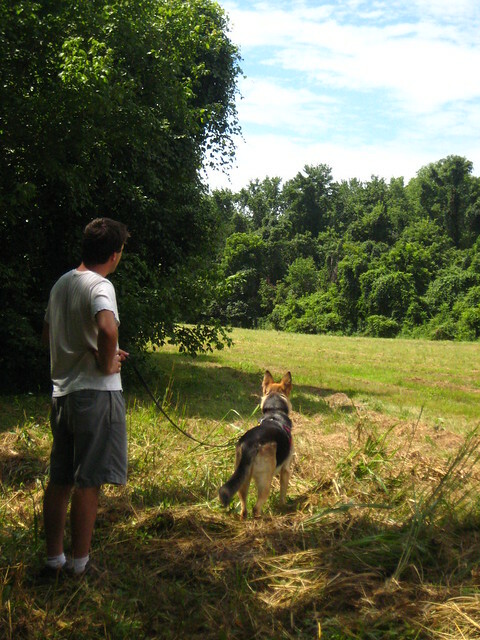 She wandered ahead of us, sniffing, as every dog is wont to do, but if we got too far back, she’d stop and reorient. I was very proud of her. 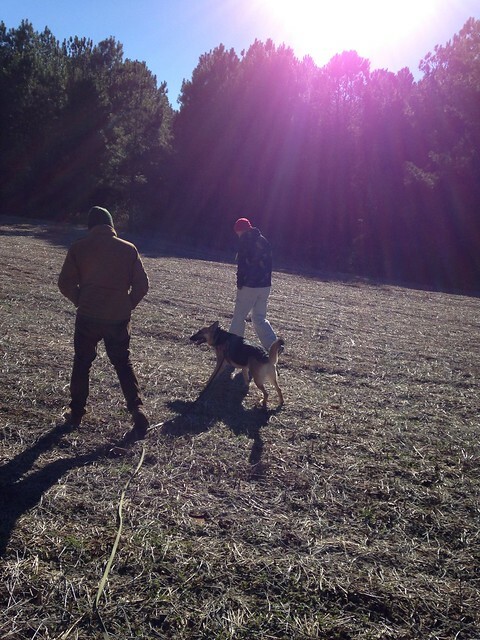 Walking with Guion and my dad. Below is one of my favorite pictures ever (taken by my sister), of Pyrrha running to me. She’d gotten too far out, and she came sprinting back to me when I called. Guion, in the left foreground, is preparing some pork rewards for her. 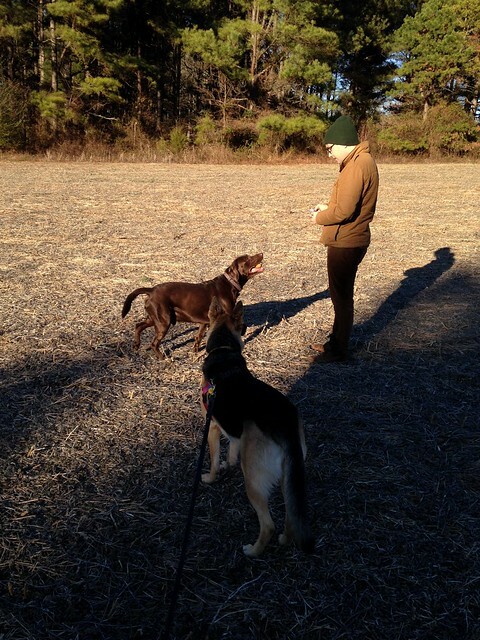 Christmas afternoon, we went back to the field to practice with Marley, my cousin’s labrador. 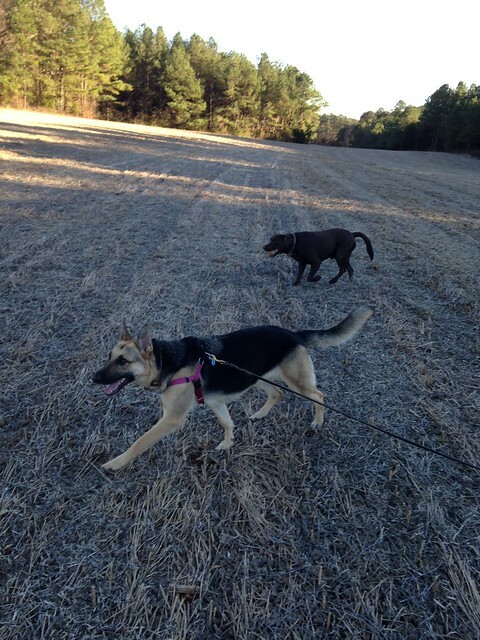 Marley is also good off-leash, so he was great accompaniment for Pyrrha. He was mostly preoccupied with fetching on our field walk, but he remained a great center for Pyrrha, who is still easily distracted by her nose and all that she picks up. 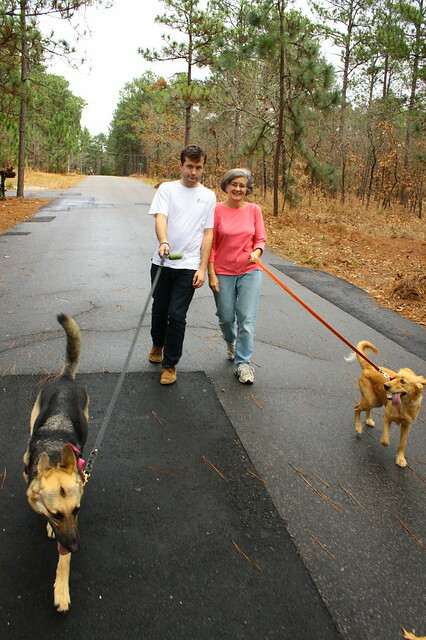 And then, when we got back to my parents’ house, we did even more off-leash training. My dad always wants to practice Pyrrha’s off-leash recall when she comes to visit, and we’re lucky to have Dublin as an aide. Dublin, as I’ve mentioned before, has the best recall I’ve ever seen in a dog. I’ve seen her stop in MID-CHASE of a squirrel to a command to come. It’s miraculous. Unfortunately, I didn’t get any photos of our outing, but it might have been the best day of Pyrrha’s life. 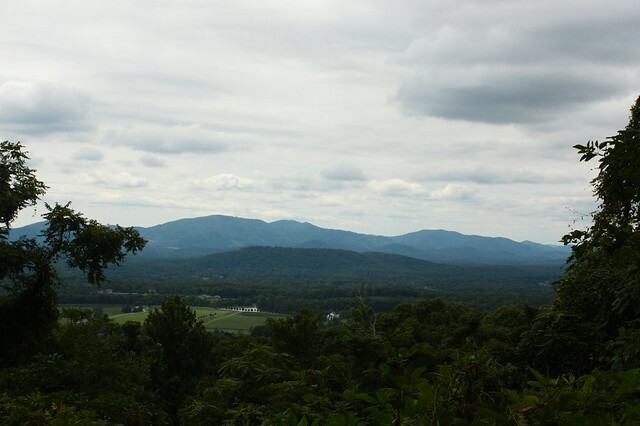 We went with Dublin and her human family to a large preserve out in the rolling countryside where dogs are allowed to roam. 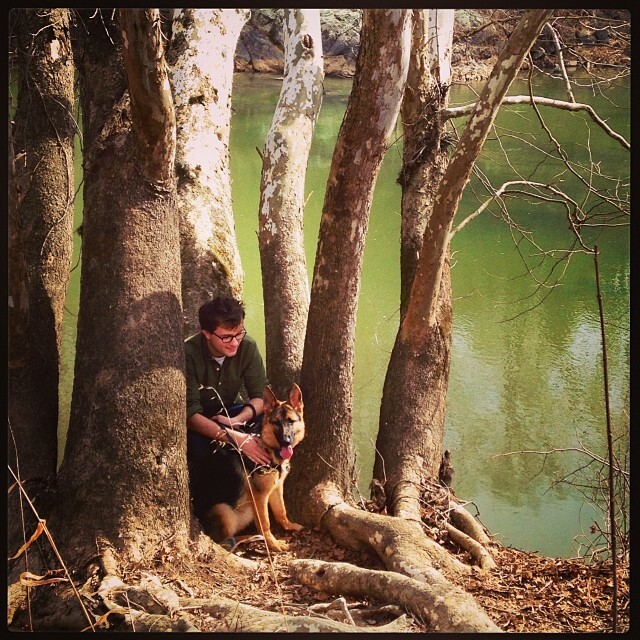 We walked the trails and Pyrrha kept her long line on, but we didn’t hold her leash once. 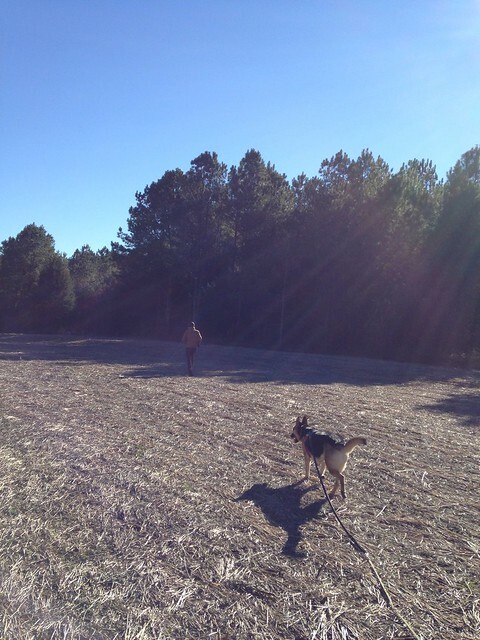 She ran with Dublin through the forest, totally free and happy. 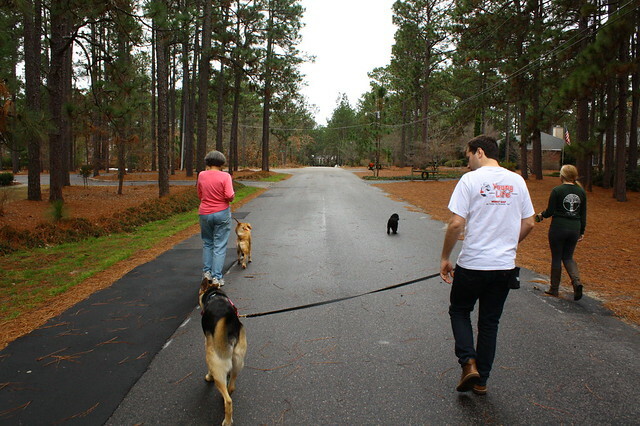 We encountered a veritable pack of other dogs (six, I think) that day, but all the humans were smart enough to just drop the leashes and all the introductions went beautifully. 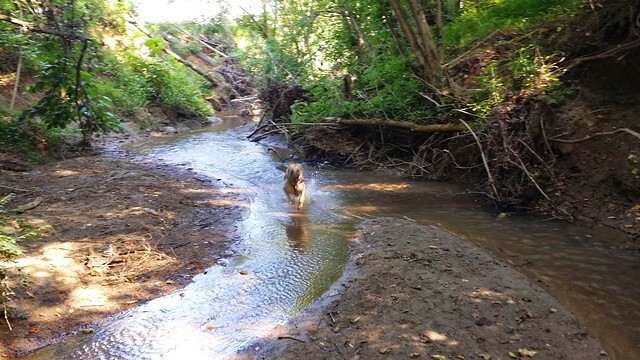 The most shocking moment was when Dublin scampered down a bank and jumped into the creek to splash around and swim. 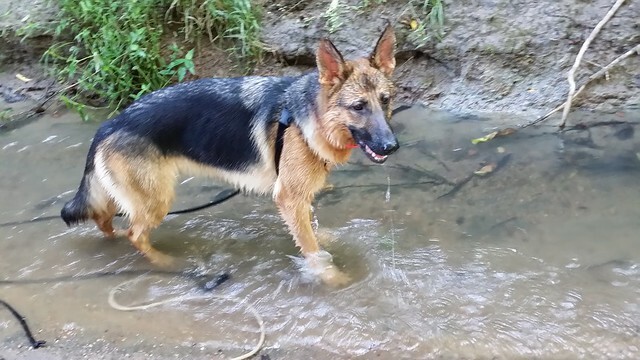 Pyrrha has always been antsy about walking through rivers, and so I assumed that she wouldn’t want to get in. 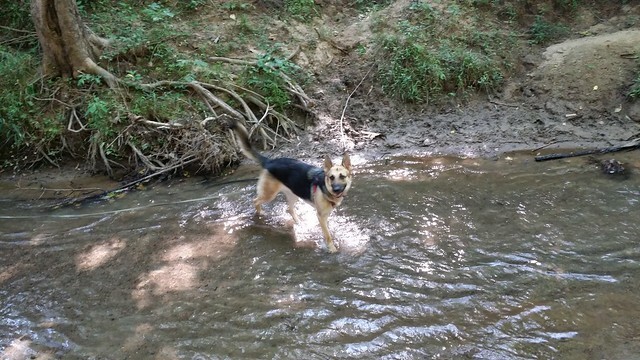 But she started whining, watching Dublin play in the creek, and so I said, “OK!” She ran down the steep bank and leapt into that water like a deer, huge grin on her goofy face. I was totally shocked. She was delighted. 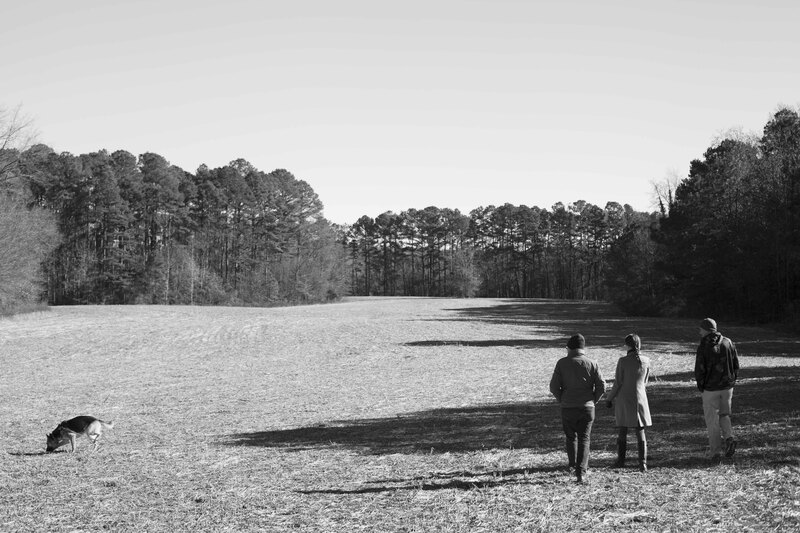 There were two moments in which she got too far ahead of us, and I couldn’t see her anymore, and I started to panic, but Dublin would go find her and Pyrrha would quickly reorient to my voice. 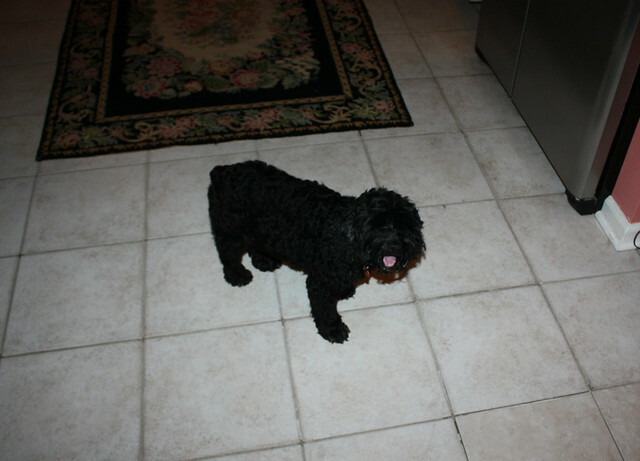 I gave her a small treat reward each time she came back to me, whether voluntarily or by responding to my call. All this to say, it was a great week of practice for her. She’s still not reliable off-leash, but she’s a lot more reliable than I thought she would be, and I was proud of the progress she’d made. Definitely something to keep working on! I’m motivated by the fact that she seems so happy to be unencumbered. 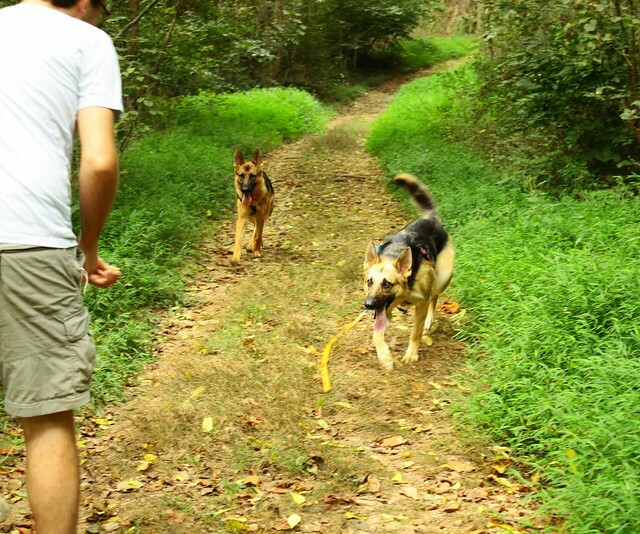 How is your dog with off-leash recall? How often do you get to practice this? The second part of our Christmas holiday was spent with my family. 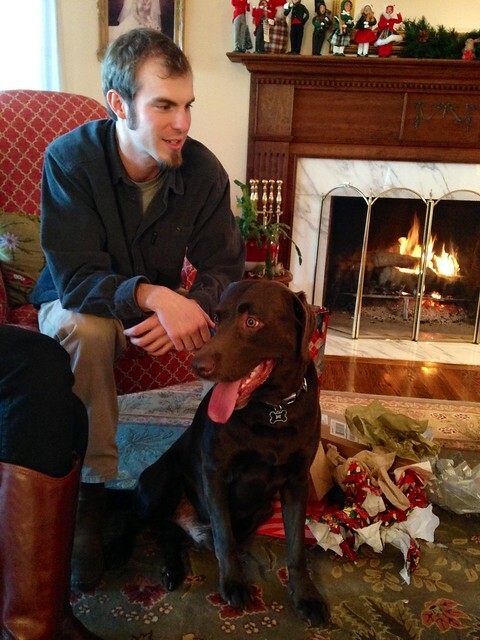 On Christmas day, Pyrrha got to meet and play with her “second cousin,” the handsome chocolate lab Marley. They had too much crazy energy for me to get many great shots of them together, but they had a wonderful time romping in the basement. Marley became rather obsessed with Pyr (he’s intact), so we had to keep him at bay from time to time. But they were great pals and got along swimmingly, as I expected they would. This holiday vacation made me thankful for Pyrrha in a way that I haven’t been before. As those of you with anxious dogs know, you spend a lot of your mental energy and emotional bandwidth worrying about your dog — especially when the environment changes, when you’re around new people and animals, etc. I felt like this was one of the first trips with her in which I was able to really be calm and appreciate her for who she is. My heart was warmed by two things: (1) She seemed to be really enjoying herself, and, (2) other people seemed to notice this as well. 2: Many members of our immediate families kept telling me, “She is really doing so well,” or, “She’s like a different dog from when she was last here.” Hearing this meant so much to me. It’s hard to recognize those subtle improvements when you’re working and living with your fearful dog day in and day out. But hearing them say such things helped me to recognize her progress too. She really has come a long way from that crawling, terrified dog who hid from me in corners of the house. And she keeps making those subtle steps toward confidence and balance. 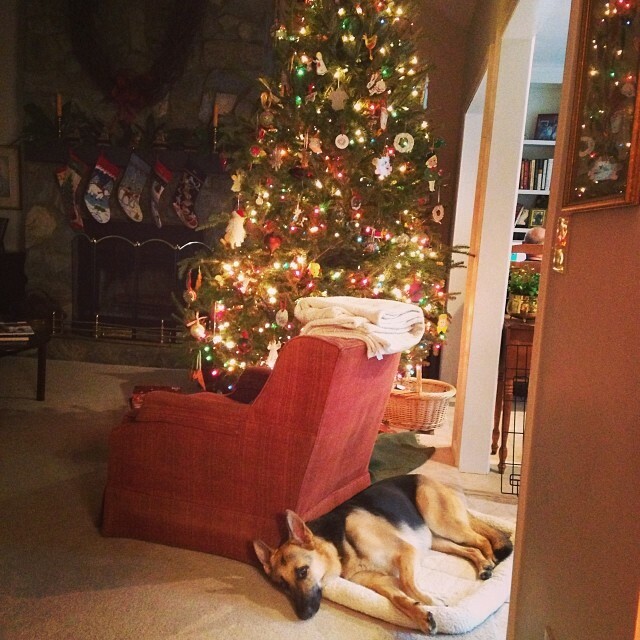 Hope you were also able to acknowledge your dog’s progress in 2013 — subtle or not — over this season of rest and reflection. 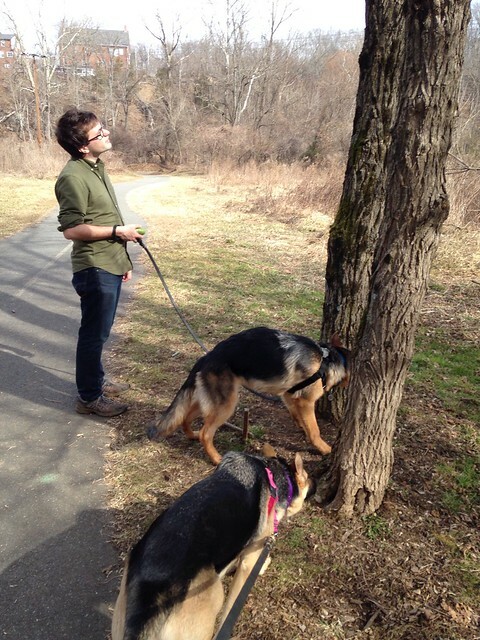 More to come about our adventures in Pyrrha’s off-leash training over our holiday! We had a very busy Christmas, and I’d like to say it was Pyrrha’s “best Christmas ever,” because she seemed to be so happy and confident (most of the time)! 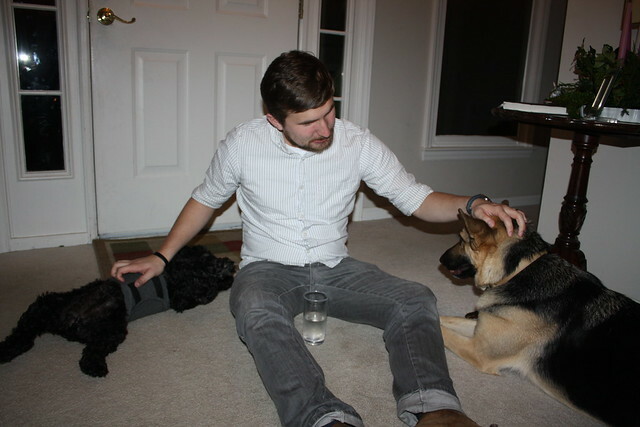 Having three young dogs in a small, one-story house lends itself to craziness, but I was proud of all three dogs: Pyrrha, Georgia (my in-laws’ 1-year-old “petite golden retriever”), and Adelaide (my brother- and sister-in-law’s 5-year-old cockapoo). 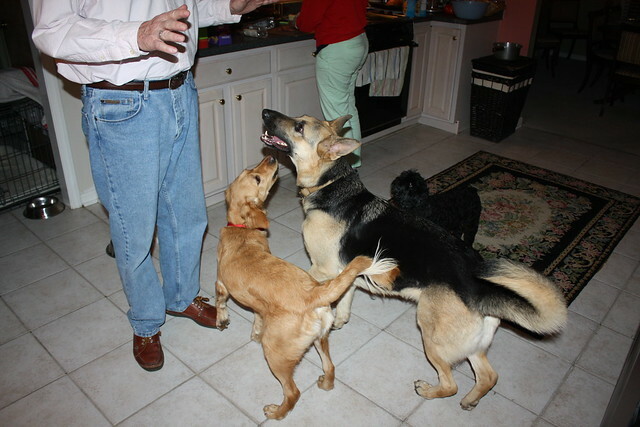 All three dogs clamoring for treats from Papa Mike. Particularly, I was proud of how well Pyrrha and Adelaide did together. 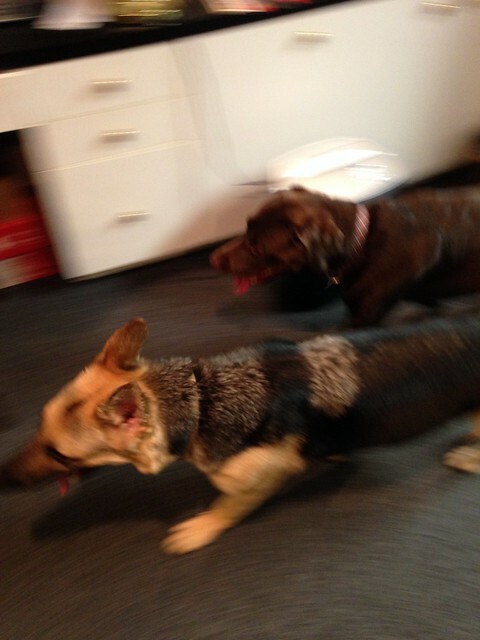 Both P and Adelaide are anxious dogs, and when they first met, they seemed to make each other more anxious. Pyrrha seemed especially perturbed by Adelaide’s body language, as it is quite hard to read (her eyes are hidden by hair, her tail is docked very short, and she is quite small). This time around, they coexisted much more smoothly. There were a few exchanges of growls from time to time when one of them felt cornered, but overall, I felt like I was able to relax a lot more and not have to constantly keep tabs on Pyrrha during our stay. Adelaide wore a Thundershirt during busier days, and that also seemed to help her a lot. She seems to really enjoy wearing it and even gets excited when Win (her human dad) pulls it out. Adelaide and Pyrrha figured out how to maneuver around each other, and they even laid near each other on separate occasions. They were also pals on our walks, always running to sniff the same spot. 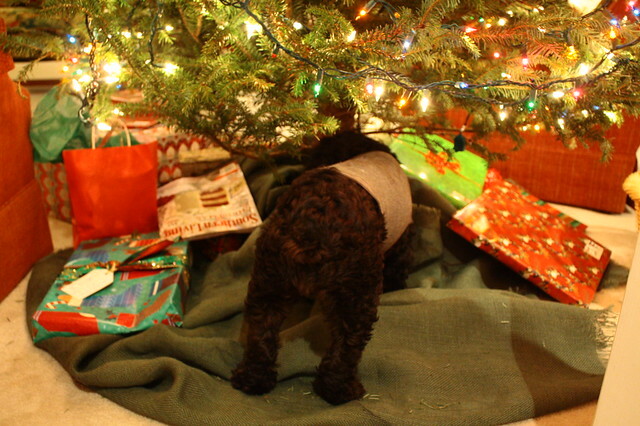 Adelaide in her Thundershirt, checking out the presents. Brother Win giving some love to Adelaide and Pyrrha. Georgia and Pyrrha remain great playmates, and they wore each other out during our stay. Georgia never seems to tire of throwing herself at Pyrrha’s face and inviting a wrestling match. It’s pretty adorable. 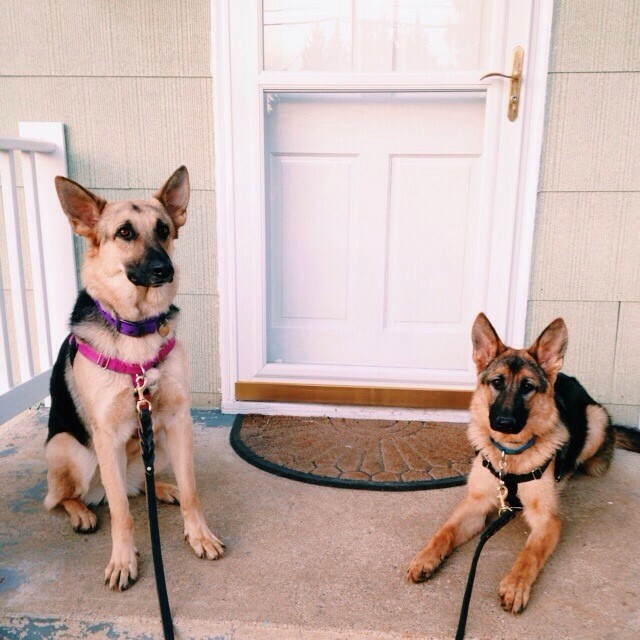 G and P on guard. 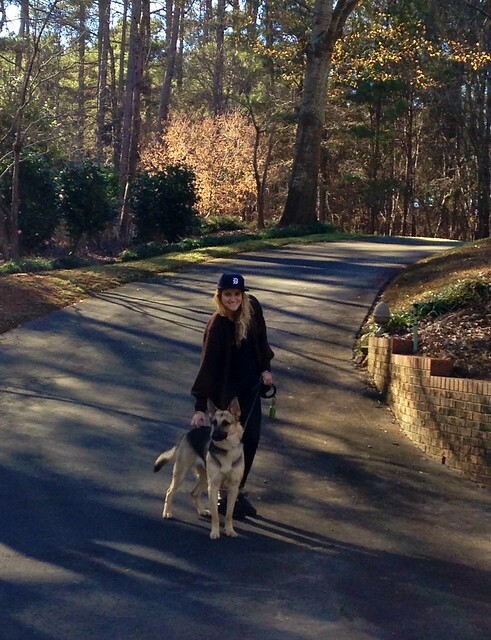 We also got to take the pups on lots of walks around the neighborhood, which they all very much enjoyed. Love Georgia’s little photo-bomb here. 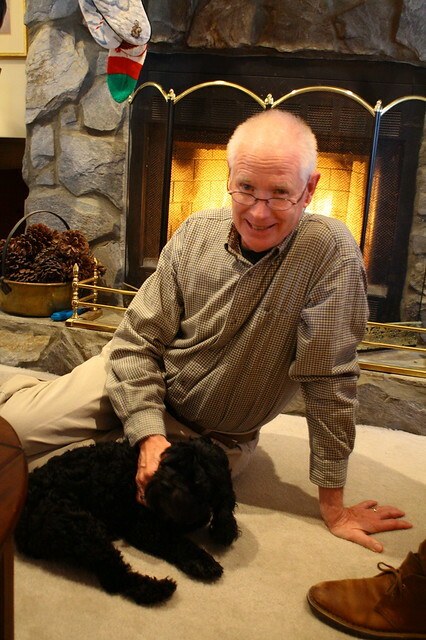 A house full of happy, largely peaceable dogs: No better way to spend a holiday! Coming up next: A recap of our Christmas, Part II! This past weekend, my sister Kelsey and brother-in-law Alex came to stay with us, and we had a wonderful time with them. As I’ve mentioned before, Alex may be the only man that Pyrrha truly loves. 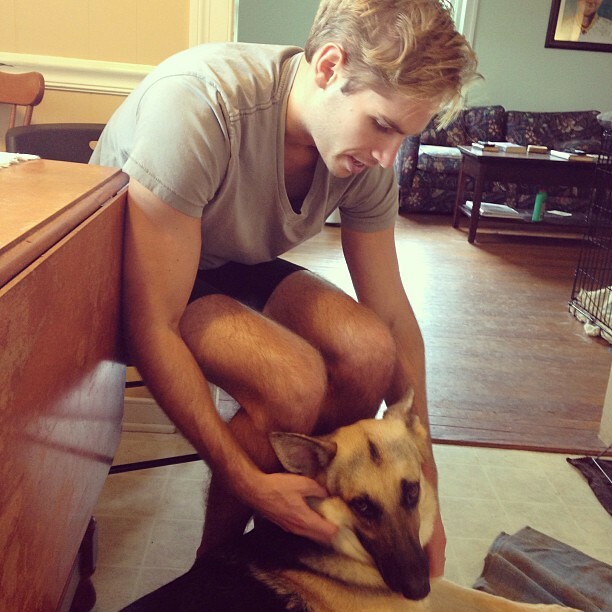 She is somehow naturally magnetized toward him, and she is unusually affectionate with him for as long as he is around. Seriously, she won’t let any other man do this. 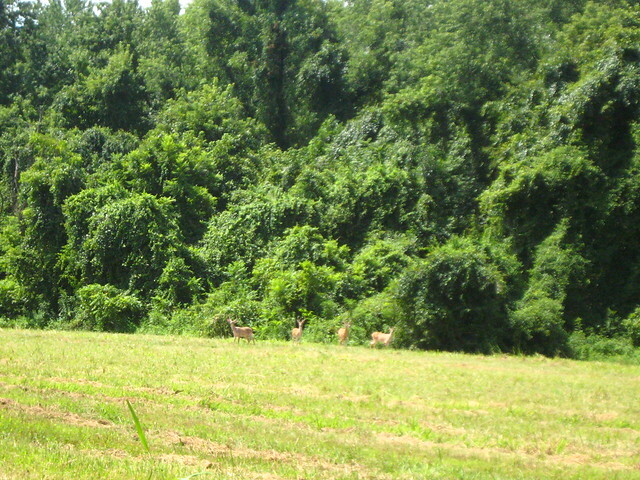 We also got to take a nice, long walk on the trail along the river, in which we saw a large herd of deer. Pyrrha was, of course, very interested once she saw them. That night, she got to spend lots of time in the yard with us while we made dinner (homemade pizza in the cob oven that Guion recently built). 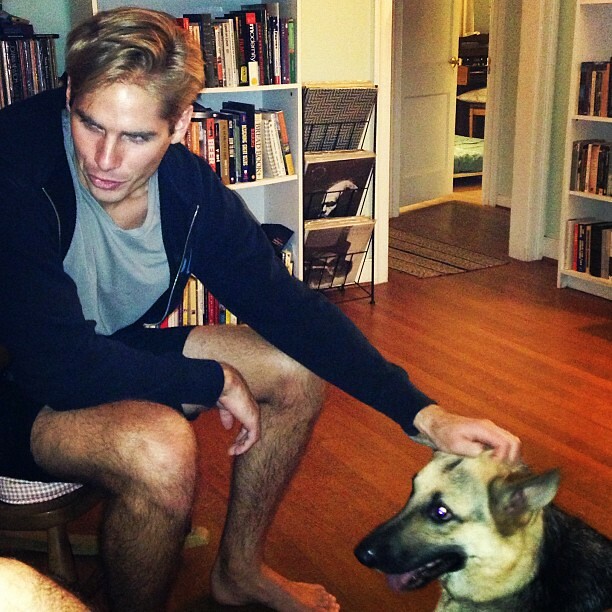 All in all, a good weekend for Pyrrha: her favorite man came to visit, and she got lots of attention and affection. 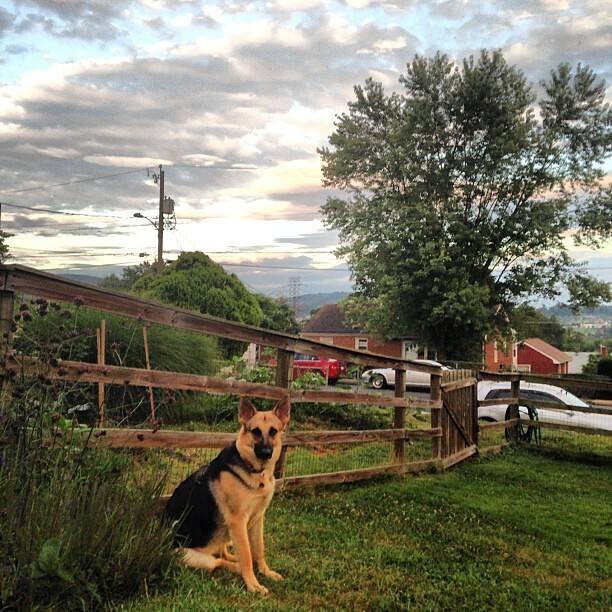 How did you and your dog(s) spend the weekend?